Outdoor hot air generator 50 kW ideal for indoor heating, tents or any premises where combustion is to be produced outside the enclosure to acclimatize. 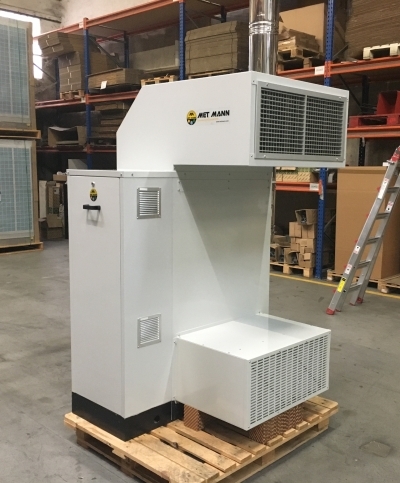 The external hot air generators POOL MANN are designed for space heating where combustion can not be performed on site to air-condition. - Greater than 90% yield. - Combustion chamber in stainless steel tubular exchanger and thick. - 3-speed centrifugal fan (1,200 / 1,700 / 4,000 m3 / h). - Termination outside weatherproof paint. - Thermal insulation with air chamber and fiberglass. - Soundproof burner with intake screens combustion air carrier. - Electric and thermostat hermetic environment. - Air intake filter to prevent the ingress of dust. - Supply air duct with double deflection grid or possibility of ductwork. - Fireplace double wall insulated stainless steel 3.3m high. - Running diesel, natural gas or propane gas.